ACMI's Hollywood Costume exhibition is opening on 24 April, fresh from its run at the Victoria and Albert Museum in London. Costume museums play a significant role in my book, as does clothing in film more generally. I was so excited by this show I was toying with the idea of travelling to London to see it, so you can imagine how thrilled I am that it's come to me instead. There's an associated program of talks and events. I'll be speaking on a panel event called The Emperor's New Clothes on Sunday 5 May, along with costume designer Katie Graham (Wilfred, Small Time Gangster) and Dr Terrie Waddell, Senior Lecturer in Media and Cinema Studies at La Trobe University. It's about the role of costumes in developing a character. I'll also be presenting a talk on Elizabeth Taylor on 21 May and 18 July, whose onscreen and offscreen clothes are so memorable. It's part of an ACMI package where you get to hear the talk and then go explore the exhibition. I've already been collecting images for my talk on Pinterest. The Emerging Writers Festival runs from 23 May to 2 June. It's a favourite festival of mine because everyone is so friendly and it's genuinely focused on writing. I'm appearing at three events. I'm moderating a Writers' Conference panel on genre on Sunday 26 May, with Jane Harrison, Alex Hammond, Wayne Macauley and Alison Croggon. I'm also speaking at the Kill Your Darlings 'Late Night Live' panel about TV on Tuesday 28 May, and at the Express Media/Signal intensive workshop for young writers on 1 June, alongside Bethanie Blanchard, Amy Gray and Samuel Cooney. On Monday 3 June I'll be reading from my book at Dog's Tales, a monthly storytelling night run by Angela Meyer at the Dog's Bar in St Kilda. Sharing the bill with me will be the very funny Lee Zachariah, who's also one of my film-reviewer buddies. And hopefully, having got used to the idea of reading my work aloud, I'll be appearing at The Wheeler Centre's Debut Mondays on 17 June. Debut Mondays are held at booze o'clock (6:15pm) in the Moat bar in the basement of the Wheeler Centre. In my book I talk about two different sorts of authenticity we seek from the clothes of the past. There's 'archival authenticity', which is understanding the garments themselves, and the right ways and contexts of wearing them; then there's 'emotional authenticity', which is using clothes to explore what it might have been like to live in the past. People who participate in cosplay or historical re-enactment societies often have the most detailed information about how to move and hold yourself in unfamiliar garments. 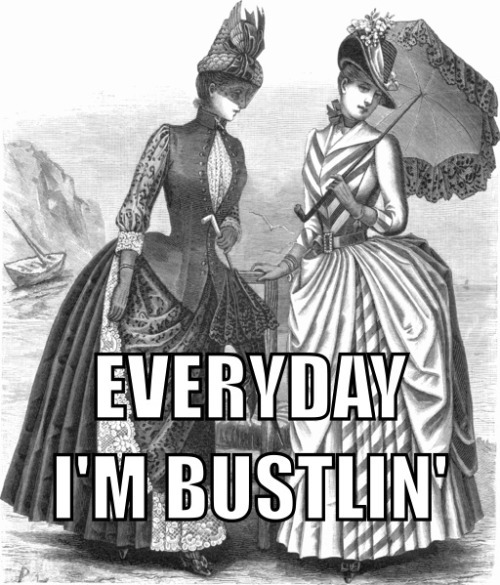 I just found a fascinating video tutorial on how to sit down while wearing an 1870s or 1880s bustle dress. The comments also discuss how to get through narrow doorways while wearing a crinoline. After steel cage crinolines were first introduced in 1856 they were the subject of much satire. This page of crinoline cartoons gives you an idea of some of the mishaps that could occur. Because they took up more space than the wearers were used to, they often did things like sweeping vases off tables with their skirts, or accidentally setting their skirts on fire by standing too near the fireplace. Crinolines were also much lighter than the previous layers of stiffened petticoats. They tipped forwards and backwards like bells, exposing the wearer's legs and undergarments; and if a high wind got underneath, it could actually flip the crinoline up over the wearer's head. Under-drawers, which weren't always worn prior to the 19th century, became a compulsory aid to modesty. This cartoon is from Cassell's Family Magazine, 1881 (or at least that's how it was labelled; I could write an entire other post about how we circulate wrong historical information through misdated and mislabelled archival material posted in social media). If that date is correct, then readers would understand the women in the picture to be wearing ridiculously old-fashioned clothes, underlining their hypocrisy in mocking the Regency outfits of their mothers. The 1893 music-hall ditty 'Oh! 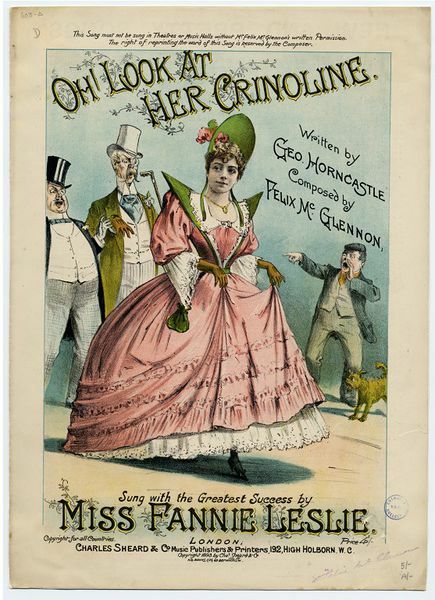 Look at Her Crinoline' was written by George Horncastle and Felix McGlennon and performed by Fannie Leslie, who was the queen of the English pantomime stage. As her 1935 obituary in The Montreal Gazette stated, "hits launched by her went all around the Empire." 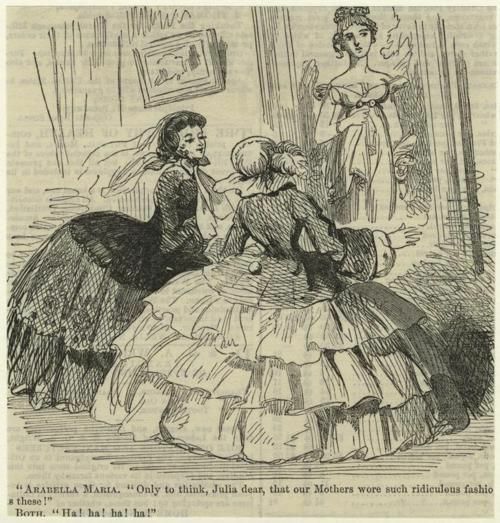 Oh, look at her crinoline! Oh, boys, gaze upon her crinoline! Oh, boys, doesn't she look green? If the wind should blow, would a poor girl have a show? Not on her crinoline! Recently my friend Melanie sent me a fascinating link to a fabric design contest at Spoonflower, a website where people can design their own custom fabrics. They have weekly design contests: this one is "inspired by the idea of what life would be like in a Jane Austen novel." Some designs are more 'professional' than others. Some are based on the kinds of patterns that would have actually been used in dressmaking in the early 19th century: delicate dots, stripes and sprigged patterns. Some designs incorporate Regency-style characters or other visual tropes. Some are more tangentially 'romantic' and don't seem to use a Jane Austen-style visual language at all. This design, in particular, struck me. It is odd that it includes the word "pride" without the matching word "prejudice". I love the phrase "Do stay for Tea". But I was even more struck by the description of the design. It reproduces a lot of the 'commonsensical' assumptions about the past that I see a lot, and that really annoy me. Dress, speech and conduct was finely tuned and comformity was essential. Being held in tightly by societys expectations is reflected in the corsets women of a certain class had to wear. Women had to have long hair, long dresses, cover their heads when out in public and maintain a 'certain appearance'. […] I would have fitted in as I enjoy doing tapestry and I like being treated like a lady and I do love and appreciate culture and refinement. 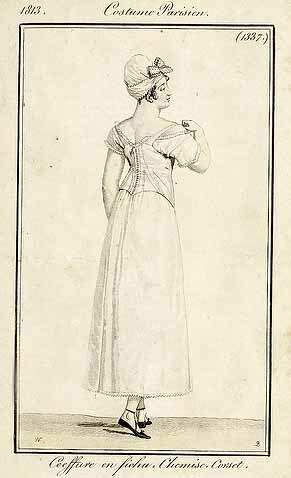 Because of the drapey Empire-line dresses, the Regency era actually had some of the shortest and least restrictive corsets in the 500-year history of the garment. Some women just wore quilted bodices with no boning. You'd wear a long-line corset only if you felt self-conscious about looking fat or wobbly in the thin, translucent muslins that were fashionable. It is seriously weird how we somehow think that only the women of the past lived under crushing social expectations just because they wore undergarments that feel unfamiliarly tight and firm to us. The expectation to maintain a thin, fit, toned body is just as oppressive today, but it's less 'visible'. Maybe future people will shake their heads at the tyranny of fitness, symbolised by skimpy G-strings that mercilessly don't leave anywhere to hide. I just read an interesting post at The Peach about 'thinspo' and 'fitspo'. These are genres of images that are circulated through image-centric blogs and social networks including Tumblr, Instagram and Pinterest. But the line between these and 'pro-ana' (pro-anorexia) imagery is very blurred. 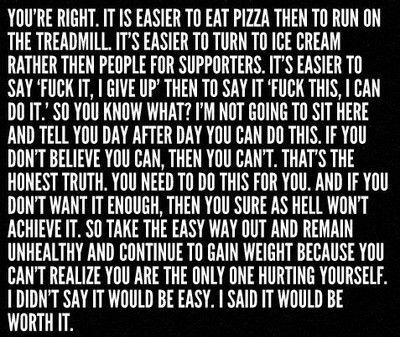 Basically I see the terms 'thinspo' and 'fitspo' as interchangeable. The idea of the images is to inspire women to become thin ('thinspiration') or fit ('fitspiration'). Some have superimposed aphorisms, like motivational posters, about the value of self-discipline and the deferral of pleasure. The point Holly Curtis is making at The Peach is that historically, women's magazines have controlled the production of aspirational imagery of women's bodies, but now women are photographing themselves. And they're accessing and circulating these images in much greater volumes than before, and in ways are much more pervasive. It's no longer the responsibility of magazine gatekeepers to promote 'positive body image', Curtis argues – it's now up to us (the producer/consumers) to develop our own visual literacy so we can separate the 'healthy' from the 'non-healthy' images. Some feminist fitness fans are seeking to do just that. Virginia Sole-Smith teases out the relationship of fitspo to its eating disorder-fostering antecedent, thinspo. Charlotte Anderson points out that "compulsive over exercise can be just as deadly as other eating disorders and yet it [is] so socially sanctioned that it’s often promoted as inspiring." At Fit and Feminist, Caitlin explains that she's inspired by images of women in action, rather than women posing passively for the viewer's gaze. The first thing I'll say about thinspo and fitspo images is that they are an obvious example of what I call 'orthovestia'. They dramatise the idea that we're only entitled to appear in public if we continuously 'work on' our bodies through diet, exercise and judiciously chosen clothing. These images divide people into 'winners' and 'losers'. Winners are those who train hard, deny their appetites, and are rewarded by being the objects – sometimes the headless objects – of the thinspo and fitspo gaze. Losers are those who 'give up', 'never try' or 'make excuses' and are relegated to longingly gazing at images they don't have the self-discipline to resemble. What's striking about a lot of fitspo is the pitiless sameness of the bodies: they're very lean and slender, with flat, toned stomachs, protruding hipbones and large gaps between the thighs, yet still with plump breasts. Some images are closer to what we'd understand as bodybuilding or 'body-sculpting' images: the women have defined abdominal muscles, bulging shoulders, arms and thighs. Traditionally, 'positive body image' campaigns have argued we should promote imagery of a diversity of body shapes and sizes. 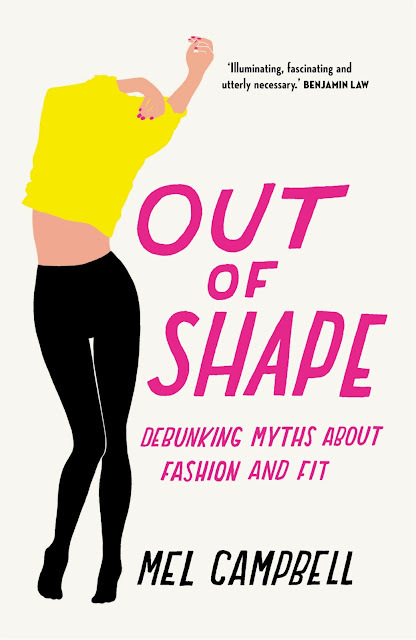 People who ascribe to the body image doctrine might argue that the antidote to thinspo and fitspo is circulating similar semi-clad images of other body types – pudgier ones; stockier ones; ones with bigger hips, or broader shoulders. However, I take a more radical view. I believe that a gaze-based culture is inherently tyrannical, turning its citizens into objects to be surveilled and judged on their outer appearances. We erase the subtleties of being embodied when we place so much value on how a body looks. And we lose empathy for other people when we're taught to obsessively focus our energies on 'improving' our own bodies. It is truly alarming that some women can only feel 'inspired' by gazing at pictures of other people's bodies. Any circulation of images of bodies is damaging; instead we need to cultivate ways of being in and talking about our bodies that aren't dependent on displaying them for other people's approval.